Follow along through the many stages it takes to build a new inground swimming pool. From digging the big pit to the (hopefully) splashing result, you'll witness the various steps and stages involved in a complete backyard swimming pool project. Not a do-it-yourself project, this pool includes a landscape architect, licensed pool contractor, subcontractors and crew. When the Cornella family was in the planning stages of their backyard pool project for their Southern California home, city planners initially questioned the stability of the property, which is perched atop a slope. The homeowners had to get resourceful and do some research on their own to ensure that the project would be approved. "I googled a satellite map of our neighborhood, and almost at every house you could see a blue spot in the shape of a pool," says homeowner David Cornella. "I showed it to them, and they agreed to start the permit process." With the project greenlighted by the city and a contractor and crew hired for the job, excavation began in early spring with a goal of completion by summer. Since it is in Southern California, weather was on their side, and it was not an especially rainy year--just cool and dry. Following the blueprints, a work crew spent several days busting up the former concrete patio and doing the most strenuous work. 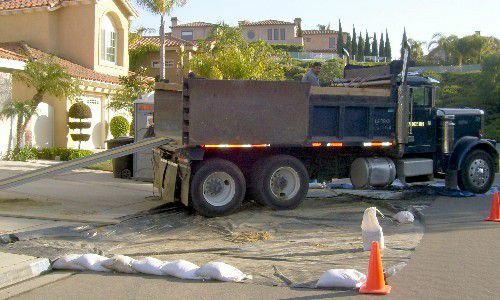 For many days, the work is tedious and repetitive: constant digging, then loading the soil from the backyard to the front and dumping it into a truck parked at the curb. Here, the soil is loaded, wheelbarrow-by-wheelbarrow-full of the dirty stuff and maneuvered through a narrow side yard to the front, where it's hauled up a narrow ramp and into the bed of the truck. The wheelbarrow is maneuvered up the ramp, where it's dumped into the bed of the truck. Can you guess how many trips this took? The guys who had to do this probably stopped counting, for sanity's sake. The soil will be hauled away and used for another project that requires dirt. Since the soil is clay, it will most likely be amended for its next use. Measurements are made in orange paint, and the floor of the pool is formed with differing depths. Although it's hard to tell, the lowest depth from surface to bottom will be 5 feet. With sturdy clay-like walls, the shape of the pool is easier to define. Looking at the positive side of digging into clay-like soil, the walls can be cut down to the desired depth and won't cave in, which could happen with fill or sandy soil. Imagine building a sandcastle - unless you use sand mixed with water, caving occurs and you end up back at square one.